A few months ago, I participated in a symposium entitled, “A Sustainable Energy State — How Remote Is the Possibility?” I prepared some talking points for the event and, heeding the injunction to re-use and recycle, turn them here into a MasterResource column. The following reflections make three main points: (1) A “sustainable” energy system, as that term is commonly used, will likely not materialize in our lifetimes; (2) except for heavily-subsidized wind, solar, and biofuel energy, the current, largely fossil fuel-based energy system is already sustainable; and (3) the “sustainable energy” agenda imperils the improving state of the world and, therefore, is politically unsustainable. 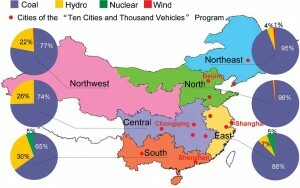 How “remote” is the “possibility” of a “Sustainable Energy State”? That depends, of course, on the meaning of sustainability. When environmental advocates call wind farms, solar power, or “next generation” biofuels “sustainable,” they imply that energy is sustainable only if it is carbon-neutral or non-emitting. If that’s the definition, then the possibility of a sustainable energy state is remote – many decades away at a minimum. Wind and solar power are more expensive than fossil-generated electricity in most markets, and will likely remain so for some time. 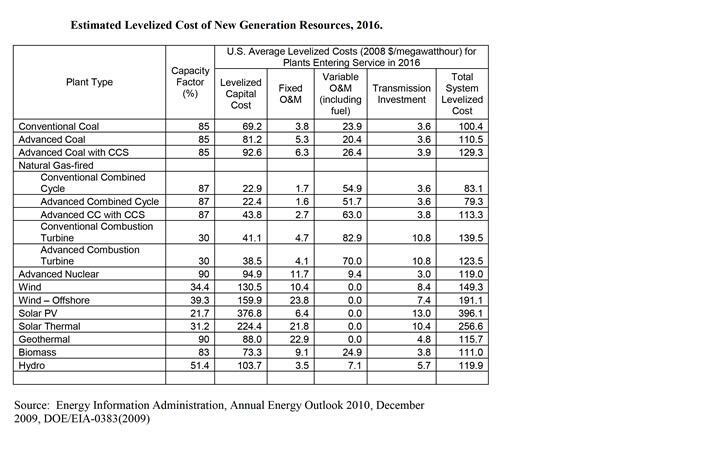 The U.S. Energy Information Administration (EIA) estimates the following average levelized costs (2008 $/megawatt hour) for new electric power plants entering service in 2016: conventional coal, 100.4; advanced coal with carbon capture and storage (CCS), 129.3; conventional natural gas combined cycle, 83.1; advanced nuclear, 119.0; onshore wind, 149.3; offshore wind, 191.1; solar photovoltaic, 396.1; solar thermal, 256.6. In addition, because wind and solar are intermittent energy sources, their value as either base load power or dispatchable peaking power is severely limited. Unsurprisingly, wind and solar depend on Soviet-style production quota (“renewable portfolio standards”), feeder tariffs, and other subsidies to “compete” for customers. Subsidy-dependent enterprises are not self-sustaining. Chronic subsidy dependence indicates that a firm’s products or services are less valuable than the resources it consumes. On both business and environmental grounds, one could argue that wind and solar power are not sustainable. Fiscal considerations point to the same conclusion. Subsidized renewables contribute to the egregiously unsustainable spending binges pushing entire states and nations to the brink of insolvency. 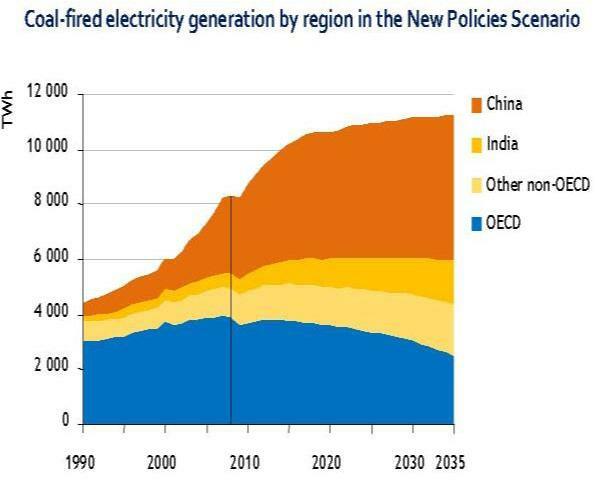 That is why the cash-strapped governments of Spain, Germany, and France are cutting back green-energy subsidies. The global recession has done more than any climate treaty or national cap-and-trade scheme to reduce greenhouse gas emissions, but it also makes wind and solar power even less affordable. Whither the War on Coal? The Sierra Club boasts that it has “un-plugged” more than 100 new coal-fired power plants in the United States. The EPA, putting pests-before-people, recently adopted an interpretation of the Clean Water Act that effectively bans mountaintop mining of coal in Appalachia. EPA also recently proposed a settlement agreement positioning the agency to regulate CO2 emissions from new, modified, and existing coal power plants via Clean Air Act New Source Performance Standards (NSPS). And unless CCS technology becomes economic faster than experts expect, President Obama’s proposed Clean Energy Standard will be an anything-but-coal standard. Although killing coal-based power in the USA would be deeply gratifying to many “sustainable energy” advocates, it will not make much difference to global energy trends (though it will destroy thousands of high-paying U.S. jobs, inflate electricity rates, and further depress the economy of Appalachia). China built approximately 110 coal power plants each year from 2004 through 2006 and is expected to build many more new coal power plants through 2035 than the U.S. and other OECD nations will likely retire. Finally, the war on U.S. coal is far from over. The death of cap-and-trade and the collapse of the Kyoto negotiations in Copenhagen took the green Left by surprise. With jobless rates still high, a GOP majority in the House, and public sentiment turning against climate alarm and backdoor energy taxes, coal may yet have a future in the U.S. electric power fuel mix. It was déjà vu all over again. President G.W. Bush, in his 2006 State of the Union Address, prophesied that cellulosic biofuel (motor fuel derived from wood chips, prairie grasses, and other fibrous plant material) would be “practical and competitive within six years.” Well, it’s now six years later. EIA expects cellulosic biofuel production in 2011 to max out at 3.94 million gallons — about 1.6% of the 250 million gallons Congress mandated in the 2007 Energy Independence and Security Act (EISA). The EISA cellulosic biofuel target for 2010 was 100 million gallons. EPA downgraded the target to 5 million gallons but even that symbolic goal proved to be too ambitious. Climatewire (Jan. 11, 2011, subscription required) reports that in 2010, commercial production of cellulosic biofuel was essentially zero. Obama’s speech was also reminiscent of Bush’s 2003 SOTU, which announced the FreedomCar and Hydrogen Fuel initiatives. Those programs too were supposed to begin transforming the U.S. transport sector by 2015. However, pundits have been proclaiming the imminent triumph of electric vehicles since 1901. As energy journalist Robert Bryce puts it, “Electric cars are the next big thing. And they always will be.” Well, “always” is a long time. Let’s just say that electric cars won’t be economical for at least another decade. Boston Consulting Group compared the total consumer cost of owning electric vehicles, gasoline-powered cars, diesel-powered cars, and hybrids in Germany, a country with high gasoline taxes. The biggest obstacle to commercialization of electric vehicles is the cost of the lithium ion batteries that propel them. Even if the batteries drop from their current cost of about $2,000 per kilowatt hour (kWh) to $700 per kWh in 2020, as many experts expect, “a 20 kWh battery, which is needed for a driving range of 80 miles (about 130 kilometers) would still cost $14,000,” says Boston Consulting. The consumer significance? Even if the batteries cost only 35% as much as they do today, the five-year fuel savings would not offset the additional expense of purchasing an electric vehicle unless crude oil prices hit $280 per barrel — twice as high as their record peak in 2008. Another roadblock to commercialization is that a motorist must plug in and re-charge the battery for several hours if he wants to drive another 80 miles. Who knows when that barrier will be overcome! Of course, as George Will observes, politicians can always “bribe” Peter to buy an electric car with Paul’s money. Congress currently provides a tax credit of up to $7,500 covering the first 200,000 electric vehicles sold. Two Michigan representatives, Democratic Sen. Carl Levin and Republican Rep. Mike Rogers, propose to expand the credit to cover 500,000 electric vehicles. However, that still might not be bribe enough to reach Obama’s million vehicle milestone. A plug-in car like the Chevy Volt can increase household electricity consumption by 40%. Purdue University economist Wally Tyner finds that under tiered electricity pricing schemes — adopted by “sustainability”-minded states like California to curb household electricity consumption — a plug-in is less economical than a Toyota Prius or a Chevrolet Cobalt, even with the $7,500 federal tax break. Tyner estimates that plug-ins do not become economical in California until crude oil prices reach $171-$254 a barrel. A million electric vehicles on the road may sound like a lot. It’s actually just 1/240th of the total registered passenger cars, SUVs, pickups, and vans in the United States. The era of the electric car is at least decades away. Perhaps more importantly, electric cars are only as “green” as the power source they plug into. China, which has the fastest-growing automobile market in the world, generates about 80% of its electricity from coal. Researchers at Argonne National Laboratory and Tsinghua University, using a life-cyle (wells-to-wheels) analysis, found that, depending on the region, replacing a gasoline-powered car with an electric car in China could increase emissions of carbon dioxide (CO2) by 7.3%, sulfur dioxide (SO2) by 300%-1000%, and nitrogen oxides (NOx) by 100%. To sum up, a “sustainable transport system,” as greens understand the phrase, is not in our foreseeable future. In a last-ditch effort to rescue cap-and-tax, proponents argued that America must quickly transition to a “truly sustainable clean energy future” to avoid future environmental disasters like the BP Deepwater Horizon blowout. Implicit in their rhetoric — as well as in their longstanding anti-nuclear advocacy — is the notion that to be sustainable, an energy system must be both carbon-neutral and failsafe. In their concept of sustainable energy, large impact events like toxic oil spills would not even be theoretically possible. But are those criteria — non-emitting and failsafe– reasonable? If the world had actually embraced this ideology at the dawn of the industrial revolution, and eschewed the use of fossil fuels as polluting and unsafe, the unprecedented progress in human health and welfare of the past century and more would almost certainly not have occurred. Billions of people would be poorer and sicker. Many of us would not even exist. Energy poverty, which kills people and decimates forests, would likely be widespread and intractable. The green definition is question-begging — it pre-judges fossil energy to be unsustainable regardless of the facts. 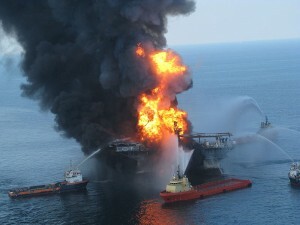 Yes, terrible accidents may happen at oil rigs, hydroelectric dams, or nuclear power plants. But the historical record provides no evidence that these politically-incorrect energy sources are sowing the seeds of either mankind’s or the biosphere’s destruction. For example, is nuclear power an unsustainable technology because of Three Mile Island? No one died in the accident and the University of Pittsburgh Graduate School of Public Health found no significant rise in cancer deaths among residents living within a five mile radius of TMI over 20 years. More children are probably harmed each year by woodstoves than by U.S nuclear power stations. The Chernobyl disaster of 1986 was the worst nuclear accident in history. Twenty-eight emergency workers died of acute radiation exposure in 1986 and another 19 died from various causes that may or may not be related to radiation exposure during 1987 to 2004, according to the Chernobyl Forum Report (p. 14). Total cancer mortality “might increase by up to a few per cent” among the “most exposed populations,” or “up to several thousand fatal cancers in addition to perhaps one hundred thousand cancer deaths expected in these populations from all other causes.” We may never know because, “An increase of this magnitude would be very hard to detect, even with very careful long-term epidemiological studies” (p. 8). The key point from a sustainability standpoint, though, is that Chernobyl was not a harbinger of more and worse disasters to come. No similar event has occurred “in some 14,000 cumulative reactor-years of commercial operation in 32 countries.” The disaster was not a consequence of some inherent flaw in nuclear power but of technical, operational, and managerial failings (Chernobyl Record, p. 33) tolerated by an unsustainable (and now defunct) political system. Nuclear power is used all around the world without major mishap. Japan, the only nation to have experienced the horrors of nuclear war, is the world’s third-largest consumer of nuclear power. Nearly 80% of France’s electricity comes from nukes. Could 62 million Frenchmen be wrong? But a surprising thing happened on the way to the apocalypse. Bacteria gobbled up the oil so fast that by August, the underwater oil plume was “undetectable.” A study recently published in ScienceExpress reports that bacteria also made short work of the massive volumes of methane (natural gas) released when the BP well exploded. When green ideologists inveigh against fossil and nuclear energy as unsustainable, they do so on the basis of a utopian standard, much as Marx condemned capitalism in the name of an imaginary “Worker’s Paradise.” As in Marxist rhetoric, too, we’re told we must choose central planning or face oblivion. In reality, modern commercial energy supports a continual (although not necessarily continuous) long-term improvement in human health, welfare, and environmental quality. By any reasonable definition, it is sustainable. If the 1982 film Blade Runner were an accurate glimpse of today’s air pollution levels, I’d be inclined to agree that the current energy system is unsustainable. 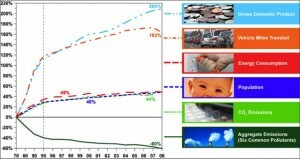 In fact, since 1970, aggregate emissions of the six criteria air pollutants declined by 60% even while population, energy consumption, vehicle miles traveled, and GDP increased by 48%, 49%, 163%, and 209%, respectively. U.S. air quality will continue to improve under regulations already adopted or in the pipeline as new cars and capital stock replace older vehicles, facilities, and equipment. These long-established air quality trends bear witness to an increasingly sustainable energy system. The astute reader will notice in the figure above that carbon dioxide (CO2) emissions have gone up as air pollution emissions have gone down. That is indisputable. What is also indisputable is that human health and welfare have improved as CO2 emissions have increased. The data reveal what Cato Institute scholar Indur Goklany calls the “improving state of the world,” a planet where people generally are living longer, healthier, more comfortable lives. From 1900 to 2006, as the U.S. population, consumption of metals and synthetic organic chemicals, and CO2 emissions increased, so did affluence and life expectancy. And it’s not just Americans who are living longer. “Global life expectancy, perhaps the single most important measure of human well-being, increased from 31 years in 1900 to 47 years in the early 1950s to 67 years today,” Goklany observes. Notably, in most areas of the world, the health adjusted life expectancy (HALE), that is, life expectancy adjusted downward for the severity and length of time spent by the average individual in a less-than-healthy condition, is greater now than the unadjusted life expectancy was 30 years ago. HALE for the China and India in 2002, for instance, were 64.1 and 53.5 years, which exceeded their unadjusted life expectancy of 63.2 and 50.7 years in 1970–1975 [citation omitted]. Al Gore and other preachers of climate apocalypse warn that global warming will afflict mankind with increasingly frequent and severe extreme weather events. In particular, warming-induced drought will supposedly cause crop failure and famine, leading to civil strife and international conflict. Gore’s film, An Inconvenient Truth, conjures up a nightmare vision of an unsustainable future. But the data point in the opposite direction — to a world of diminishing danger from climatic factors. Goklany is the go-to source on this topic as well. After peaking in the 1920s, global average annual deaths and death rates from extreme weather (droughts, floods, storms) declined by 93% and 98%, respectively. 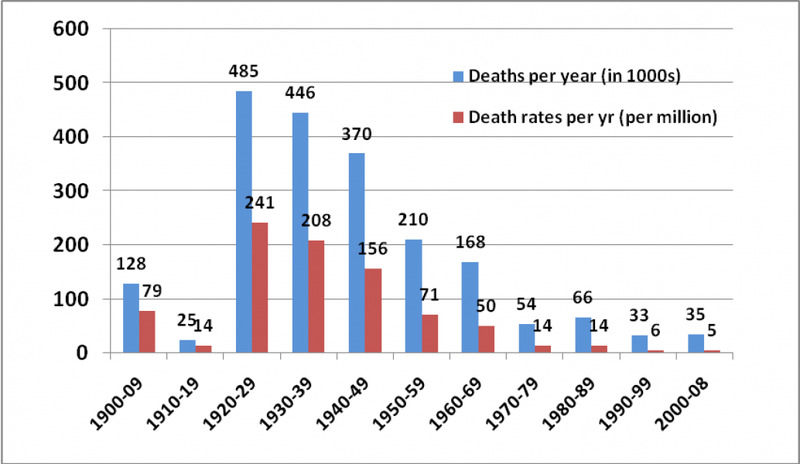 The 93% decline in total deaths is truly remarkable considering that weather and mortality data were sparser in earlier decades and that global population increased more than 3-fold since 1920. Drought is responsible for more than half (58%) of all extreme weather-related mortality since 1900. Since the 1920s, deaths and death rates from drought have declined by 99.97% and 99.99%, respectively. We hear time and again that the 1990s and the 2000s were the hottest decades “on record,” and that if this keeps up, there will be water shortages, food supplies will decrease, and hunger will increase. Yet as Goklany points out, between 1990 and 2006, an additional 1.6 billion people gained access to safe drinking water. Similarly, despite the supposed twin evils of global warming and population growth, per-capita food supplies worldwide “increased from 2,254 Cals/day in 1961 to 2,810 in 2003.” Goklany elaborates: “The proportion of the population in the developing world suffering from chronic hunger declined from 33% to 16% between 1969–71 and 2010 despite a 111% population increase” (personal communication, Feb. 3, 2011). Were fossil fuels an obstacle to these stunning improvements in the state of the world? No. 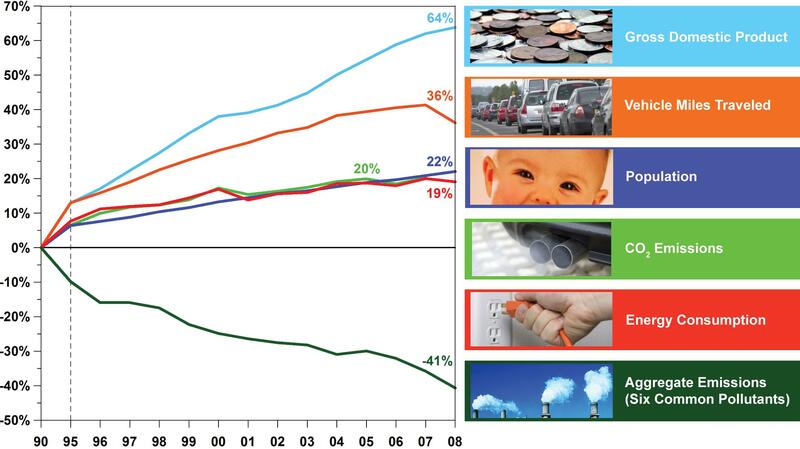 Fossil fuels were a key factor driving those improvements. Fertilizers and pesticides are manufactured from fossil fuels. Irrigation pumps and farm machinery run on fossil fuels. So do the vehicles used to transport food from surplus areas to deficit areas. So do the vehicles used to provide emergency assistance to disaster-stricken areas. More fundamentally, people are living longer and healthier because the world is wealthier, and fossil energy supports economic growth and technological progress in scores of countries around the world. Will Global Warming Impoverish Future Generations? The rejoinder to the foregoing is that we ain’t seen nothin’ yet. We’re supposedly at the early stages of man-made global warming. As warming accelerates, the impacts will become increasingly severe, “threatening the survival of civilization and the habitability of the Earth,” according to Al Gore. However, the warming rate over the past 30 years has been remarkably constant — about 0.14°C per decade in the University of Alabama-Huntsville satellite record. If that rate continues, the globe will warm 1.4°C during the 21st century — below the Intergovernmental Panel on Climate Change’s (IPCC’s) “best estimate” (1.8°C) of its coolest (B1) emissions scenario. Apocalypse not! But for argument’s sake, let’s assume global warming proceeds according to the IPCC’s hottest emission scenario (A1F1) and atmospheric temperatures increase by 4°C or more. Let’s also assume, per the UK Government’s Stern Review of the Economics of Climate Change, that such warming could reduce global GDP by 20%. To be sure, the Stern Review is an outlier in the climate economics literature (see here, here, and here). But let’s give climate Cassandras the benefit of every doubt. Even under those assumptions, it turns out, the state of the world keeps improving. Again, Goklany provides the indispensable analysis. Even if we accept the Stern Review’s 95th-percentile GDP loss estimates under the IPCC’s warmest emission scenario, developing countries’ net welfare (after accounting for climate change) would increase from $900 per capita in 1990 to $61,500 in 2100 and $86,200 in 2200 (in constant 1990 U.S. dollars). For perspective, Goklany notes that, in 2006, GDP per capita was $19,300 for industrialized countries, $30,100 for the United States, and $1,500 for developing countries. In addition to being wealthier, future generations are bound to develop superior technologies in such critical endeavors as agriculture, medicine, water resource management, disaster preparedness, and emergency response. Thus, regardless of climate change, global welfare should improve dramatically over the next two centuries, and developing countries’ adaptive capacity will far surpass that of industrial today. The “sustainability agenda” calls for government intervention to prop up technologies that are net resource consumers, net job destroyers, and non-self-sustaining. Government support for politically-favored renewables is contributing to unsustainable budget deficits. Sustainability advocates demand that governments put a price on carbon, that is, penalize the affordable energy sources that are vital to wealth creation and the improving state of the world. The full flowering of the sustainability agenda — as in Al Gore’s campaign to “re-power America” with zero-carbon energy in 10 years — would make U.S. prosperity unsustainable. Because anti-carbon schemes threaten prosperity and jobs, the American public rejected cap-and-trade. And because affordable energy is vital to the improving state of the world, the Copenhagen climate negotiations ended in failure. The sustainability agenda is politically unsustainable. Policy wonks on the left believe they are better at seeing the future and finding a way of getting there faster. They are perfectly comfortable with dispensing with the market (at least when it comes to directing investment) and having government make investments in “green industries” (the 21 century’s equivalent of the 19th century’s “infant industries”) using taxes, subsidies and direct government expenditure. Naturally, government will be the beneficiary of encomiums from the smart set and those who get green jobs while those who lose jobs will be left shrugging. Another Marlo Lewis keeper, beautifully argued and comprehensive in sweep, ironically perforating the green curtain so that one can glimpse reality. Every concerned citizen should forward this article to their elected state and federal officials. Without their support for the concept of affordable and available energy, the majority of our citizens will be subjected to living in fuel and food poverty (more than 10% of their income for fuel and/or food). The U.S. has within its grasp enough relatively inexpensive energy sources to last over 100 years at our current rate of consumption. We need to develop natural gas and oil recovery methods to ensure we have a viable energy program that will drive our economy to once again become the world’s beacon of hope for centuries to come. Let free-market capitalism flourish once more….central government controlled economies are the bane to personal and economic freedoms. Very well written. It would be a wonderful response to the New York Climate Action plan comments advocating a sustainable response to the NY goal of an 80% reduction of CO2 by 2050. Environmental advocacy groups had members submit the following as a comment: Choose Clean Energy, Not Business as Usual – The Draft plan relies too heavily on unsustainable technologies like nuclear power and coal with carbon capture and sequestration (CCS) to achieve its goals. The pathway to a carbon-free future should be focused on energy efficiency and conservation and clean renewable energy such as wind and solar power. A recent report by Synergy Energy Economics, Beyond Business as Usual, shows that we can achieve 80% reductions by 2050 by increasing our reliance on energy efficiency and renewables, retiring all coal plants, retiring aged nuclear plants in the northeast and not building any new nuclear plants. I oppose including coal and nuclear in a low carbon portfolio standard. This would force utilities to purchase power from these sources and drain resources away from energy efficiency and clean renewable energy. Comments can be submitted at http://www.nyclimatecomments.us/. The only truly sustainable path for humanity is to constantly expand our technological capabilities. This requires a constantly growing resource base. Wasting resources on things that cannot meet civilization’s needs is incredibly foolish. I too have imagined such a world, Ed. And so did the ancient Greeks. Consider the story of the trickster godlet, Prometheus. Zeus assigned Prometheus, a second generation Titan, the task of forming humankind from water and earth, which Prometheus did. In the process, the Titan became fonder of his creation than Zeus had anticipated, since the king of the gods wanted to prevent people from having power–especially over fire. Caring more for mankind than he feared the wrath of Zeus, Prometheus stole fire from Zeus’ lightning and gave it to the people he loved, so that the quality of their lives might increase. Prometheus went on to perform other wonders benefiting mankind, which sealed his ultimate fate. For Zeus, in reprisal, bound Prometheus in chains upon a mountain face, where an eagle or vulture ate his ever-generating liver each day. Of course, Aeschylus’ tragedy, Prometheus Bound, reports this story. Prometheus is a cautionary tale for a modernity fashioned from Zeus’ lightning. The fossil fuel industry should take special care of its liver. I might add that if we define ‘sustainability’ as market success over time, or as improving affordability and reliability and quality, the number one opportunity with energy is privatization. Privatization of the subsoil for energy sustainability is key (see http://www.masterresource.org/2010/09/subsoil-privatization-ultimatereform/). There’s a lot of information here. As is often the case with the discourse on this forum, I agree with some parts of it and disagree with others. To avoid a treatise-style comment I’ll just touch on a few. I completely subscribe to setting realistic expectations, which President Obama’s SOTU was not in any way an example of. For as much as I am a proponent of all of the technologies he mentioned, none of his goals were near the realm of plausibility. This just ends up being distracting rather than energizing and depletes the credibility of sustainable efforts. Our food supply is not a great example of fossil fuel driven success. Yes the amount we produce has increased, but so has many other less attractive side effects. Our average application of petroleum-based concoctions go up in frequency and potency every year, as does the resilience of weeds and insects. Sodium levels in soils are rising while nitrogen levels are falling. We have a net loss of top soil with more chemicals being washed into stormwater runoff than ever before. Not a sustainable model. More people may have access to clean water sources, but the frequency of water shortages is rising, even here in the U.S. I don’t think that sustainability is in line with Mr. Bradley’s definition of “market success over time” and it should only deal with “reliability and affordability” in terms of applying those qualities to solutions that can be utilized indefinitely without negative externalities. ‘Market success’ is often determined by the currency of profit dollars, not quality of life. Lastly, an anti-carbon direction does not imperil American prosperity. Despite our collective, inherent aversion to change we are amazingly adaptable. New market conditions would bring new demands and new companies to meet them. solutions that can be utilized indefinitely without negative externalities. Such things do not exist in the real world. Thanks for having the courage to call a spade a spade, Marlo. “gaiarrhea” is the term used to describe the incessant spouting of rhetoric by watermelons (green on the outside, commie red on the inside) claiming that the planet is dying and humans and capitalism are responsible for it, despite endless reams of empirical evidence to the contrary. “sustainabilchemy” is the term, borrowing from medieval alchemy, used to describe the beliefs held by watermelons that compact fluorescent lightbuls, windmills, solar panels, biofuels, electric cars, locally grown food, recycling, waste reduction, etc. will save the planet and humanity from the destruction wrought by capitalism and humanity. Remember the environmental Kuznets curve, people. It tells you all you need to know. Don: Yes, lefty wonks have seen the future, and they know it works! Barry: Good advice. Somehow I missed Jerry Taylor’s essay. Will rectify that oversight. Jon: Well and poetically said. Rob: Yes, what the Set America Free crowd could more usefully advocate is separation of oil and state. (2) Yes, pests and weeds get more resistent to existing technologies but that’s one reason why ag is one of the most research-intensive of human endeavors. This arms race is not one that is ever finally won, but is it one that we keep winning — the proof being the long-term improvement in yields. A similar arms race exists between pharmaceuticals and diseases, which keep mutating into newer more resistent strains. Nonetheless, people are living longer and healthier. (3) Related to the foregoing, biotechnology is providing and should continue to provide many new weapons for both our disease control, pest control, and soil management arsenals. As my colleague Greg Conko and co-author Henry Miller say in a recent op-ed: “Gene-spliced, or so-called genetically modified, crop plants are now grown on nearly 150 million acres in the United States alone, helping farmers to increase yields, reduce pesticide spraying, and save topsoil — and without injury to a single person or damage to an ecosystem.” http://cei.org/op-eds-articles/rush-condemn-genetically-modified-crops. (4) An interesting tidbit: The atmosphere’s rising CO2 content not only helps crops grow faster and larger, and use water more efficiently, it also helps them cope with soil salinity stress: http://www.co2science.org/subject/s/summaries/salinitystress.php. Chris T: A reasonable assessment, I think. Carbonicus: Funny stuff! I’ll recycle your terminology in future posts. Very well written and explained. I agrea with most of what you say but would question both sides definition of “sustainability”. Since I do not believe the earth is creating new oil as fast as we are consuming it (if at all), there obviously will come a time when it gets much more expensive to extract and finally a time when it does “run out”. Who knows how long that will be. But as a culture that stands on the ingenuity of science and technology, we ultimately have little choice but to rely on technology to create other sources of energy. I applaud any attempts at using less energy, if for nothing else than personally saving a buck by driving a more effecient vehicle or having my house better sealed. And if some research money is spent on looking into alternative, fine. As long as it is reasonable. However, aside from oil having a limited supply, which I don’t think many would argue with, its main sources are not in the US so it would behoove the US to look for alternatives for the long run. 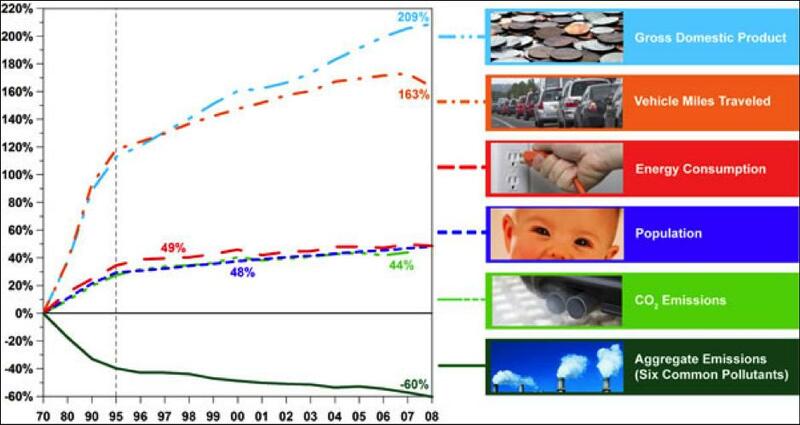 I think we have seen quite an increase in the effeciency of solar cells and gasoline powered engines and that these effeciencies will increase over time and accelerate as the price of oil increases. Yet as a nation that relies heavily on cheap sources of energy produced in foreign lands we have to keep an eye on things and continue to develop nuclear, NG, and coal technologies. My main point being that oil will one day be used up are vastly more expensive so there is no harm in developing alternatives and in doing what we can to increase efficiencies. Mr. Lewis, I think that the discrepancy in our views revolves around what “sustainability” really encapsulates. Sustainability is not about indefinitely winning battles against nature–on the contrary sustainability is about not having to fight battles at all. We could be growing more hydroponic crops in greenhouses, needing almost no pesticides or herbicides, with higher yields per acre and using 70% less water (current national water usage pegs irrigation at 31%). That is avoiding battles, and not wasting energy on a fight that we will never actually “win”. Continuous expansion on this planet, in any arena, is inherently unsustainable. Per Chris T.’s comment, there are countless examples in the very “real” natural world of systems that have no waste at all. In fact we are the only species that does not operate on such a model. Even if humanity can never reach that level of balanced perfection, it’s not like we’re even close right now–we have plenty of room for improvement. One thing that does not exist in the real world is a “constantly growing resource base” of finite resources. In my humble opinion, sustainability is also not a technological fix to compensate for a wasteful lifestyle. Sustainability is the lifestyle itself that operates around an idea of balanced efficiency in a closed system. I think one could argue that the defense of coal is just as politically motivated its opposition—though I don’t consider myself part of a political attack and though carbon-free energy is a swell goal, for now NG is an essential and important part of our energy matrix, temporary as it may be. In the meantime, as Richard touches on, we should be preparing and facilitating the transition.